Seal EVERYTHING! A soundproofed room is like a fishbowl. The more holes in the fishbowl, the more water will come out. The more holes in your soundproof room, the more sound will come through. Sound Sealant will seal all those holes. 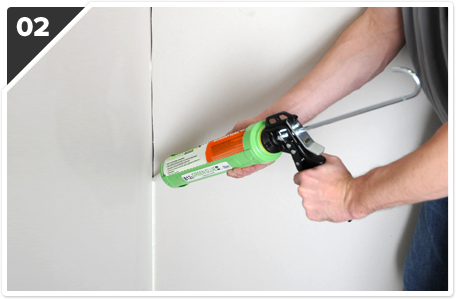 The Caulk is white, acoustically tested material to reduce transmission noise as well as airborne noise that get through any cracks, gaps, and joints. This product is mold resistant, and UL approved. Each tube is 28oz and does over 86 linear feet with easy clean up! Contact us about how to properly use this product. Putting Sealant on all the joints.